The weather is starting to warm, the daylight hours are becoming warmer, and the urge to get outside has peaked. However, a lot of the higher elevation trails are still covered with snow, so what are some of the best hikes to do around this time of year? While you may not find yourself climbing up a big mountain to take in an incredible panoramic view, there are still many great hiking trails accessible that offer a fun partial-day outing, great exercise, and incredible scenery. Despite its elevation, the Stawamus Chief is generally one of the first mountains to be clear of snow and accessible in the spring. However, hikers should double check BC Park’s website before going to the trail early in the season to ensure it’s accessible. The trail itself is a nice steep climb, mainly consisting of wooden steps. It’s a great alternative to the Grouse Grind and a great way to get in shape before tackling some of the really long and steep trails in Garibaldi Provincial Park during the summer months. If you’re planning to start the hike from Shannon Falls, make sure to arrive early as the smaller parking lot fills up quickly. If it’s full, you’ll have to drive north towards Squamish and park in the designated Chief parking lot. Starting from this parking lot means the trail begins with a punishingly steep wooden stairwell. More information about The Chief in Squamish, BC. 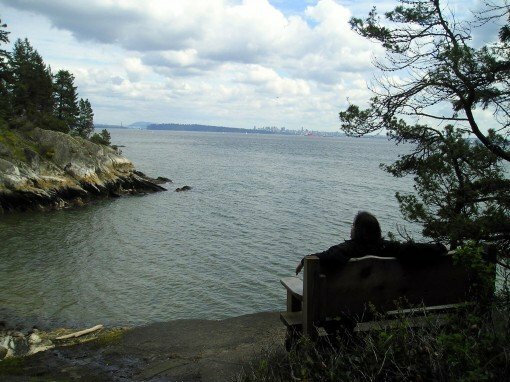 Relaxing on a bench at Lighthouse Park, enjoying the distant view of Vancouver and the Lions Gate Bridge. Lighthouse Park is tucked away along the coastline, just off West Vancouver’s Marine Drive. There’s a network of trails in the park offering some varied elevation, many scenic views, and a relaxed atmosphere in the west coast rainforest. There are several scenic viewpoints along the trails including the famous lighthouse and a distant city view from Starboat Cove. The easiest way to access the park is to either take Highway #1 to Horseshoe Bay and backtrack along Marine Drive, or drive out along Marine Drive from the Park Royal Shopping Center. More detailed information about Lighthouse Park. Looking out at the marsh at Minnekhada Regional Park with the high knoll in the background. 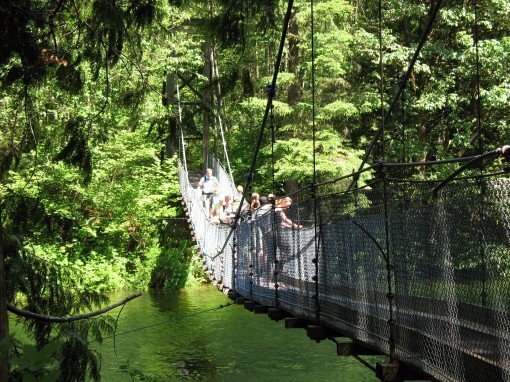 Located near the shores of the Pitt River and the community of Port Coquitlam (technically the park is located in Coquitlam but you have to drive through Port Coquitlam to reach it) is Minnekhada Regional Park. The park features hiking trails that wrap around a marsh habitat and a few viewpoints of the area on top of the surrounding hills (referred to as “knolls” in the park). Minnekhada is a great place for bird watchers or to take the family for an outing. Trail runners will also enjoy the trails as there are options for longer routes and the park is usually less-busy than some others, like Buntzen Lake. To reach Minnekhada Regional Park, drive along Lougheed Highway and turn onto Coast Meridean heading north. Turn right onto Victoria Drive and follow this road as it suddenly veers off to the left and eventually turns into a gravel road. The park sign will be on your right just after the gravel road begins. More detailed information about Minnekhada Regional Park. People crossing the suspension bridge at the north end of Buntzen Lake. While is may look like a natural lake typical of what you’d find in the Pacific Northwest, Buntzen Lake is actually a man-made lake, turned into a recreation area by BC Hydro. The tail that loops around the lake is 8km long and there is a beach area on the north end of the lake that is much quieter from the popular main beach near the parking lots. There are several other more difficult hiking trails that climb up the surrounding mountains and offer viewpoints of the area, including the popular Diez Vistas Trail. The easiest way to get to Buntzen Lake is to drive to Port Moody and follow Ioco Road along the north side of the inlet westward. Turn right onto 1st Avenue and at the split a few block later, go right onto Sunnyside Road and follow this road right to the entrance of the park. Note #1: During the spring, the water level of the lake is often quite high and the floating bridge is underwater (not really a floating bridge). This means that you will have to hike around the water, which means out towards the main gate, adding a few kilometers and significant time to your out. Note #2: The gate to the parking lot closes daily at a certain time that is posted at the entrance of the park. The closing time changes based on the time of year. Don’t get stuck! Check this time and make sure you leave yourself enough time to get back to your car and exit the park. More detailed information about Buntzen Lake. “BP” markers on trees mark the route along the Baden Powell Trail on the North Shore. The Baden Powell Trail is a long trail that stretches across the entire North Shore, from Horseshoe Bay to Deep Cove. However, with a little planning, the trail can be hiked in sections and a car can be left at both ends or transit can be taken at several points along the route. One of the most scenic sections is from Deep Cove to Lynn Valley. This section of the Baden Powell offers a view of Indian Arm at Quarry Rock, trails that meander through the forest and cross small wooden bridges through the lower Mount Seymour section, views of both Lynn Creek and the Seymour River at their crossing points, including the popular crossing at the Lynn Canyon Suspension Bridge. There are bus stops at both ends of the trail, so while a bit of planning is required, it can make for a great day outing on the trails. More detailed information about the Baden Powell Trail. I hiked to Norvan Falls other week and it’s a good late-spring hike too. There was a little bit of snow left on the trail but it’s probably gone by now. Lots of water coming over the falls from all the snow melt. Definitely a late spring hike. Upper Shannon Falls in Squamish is another good hike this time of year! Excepct Chief and Diez Vistas it is a little bit boring, it is still more what we can do in spring for example Spahat rigg, Tunnel bluffs, Mount Gardner, Mount Killam, Lynn peak, etc.